Do you ever have a friend tell you about something and you just nod politely and not check it out? Then another friend of yours tells you the same thing, but you don’t listen to them either? Finally you check it out and you realize they were right and it is as AMAZING as they said? You heard all of these things and ignored them until you finally listened and gave them a try. Well my example is about the new crop of TiVos. Chris Ashley on the SMR Podcast talked over a year ago about how he saved a bundle of money by upgrading his TiVos. Then Dave Hamilton of the Mac Geek Gab said the same thing. In my head I thought, “oh sure, this is too good to be true.” But it turns out they were right. I’ll explain more as I walk through the problem Steve and I were trying to solve and how we finally “got” what they were trying to tell us. Steve and I had a cable box from Frontier (our TV and FiOS Internet provider) and 3 aging TiVos giving us cable TV in four rooms. We bought these TiVos over time, and the very newest one, a Premier Series 3 HD was 6 or 7 years old. We love TiVo (and love TV evidently). To use a TiVo, you have to pay a monthly fee for each TiVo unit in order to get the program guide, but our oldest TiVo had lifetime service. Sadly this oldest one in Steve’s study started to fail. The symptom was a glitchy signal, so we assumed it was the cable card, and had Frontier replace it for us. That didn’t fix the problem. We then noticed a whine coming from the device, so we thought/hoped it was a dying hard drive. We bought a replacement drive from Weaknees. They specialize in helping people repair and upgrade their TiVos. The good news is Weaknees is right near our house so Steve was able to run over and get the drive quickly, but the bad news is it didn’t solve the problem. Now we were in a dilemma. Do we continue to spend money to try to repair this device? Replace the power supply? The back plane? It seemed foolish to pour more money into the oldest TiVo, even though it was free on the TiVo service. That’s when I started replaying in my head what Chris and Dave had been saying. They both talked about using one TiVo as a main device with a cable card, and broadcasting the recordings to TiVo Minis. The Minis are essentially clients that talk to the big TiVo as a server. They claimed the Minis didn’t need cable cards or a monthly service fee from TiVo. This sounded swell, but I had never taken this idea seriously because they rely on having a house wired for Ethernet. Our house was built in 1990, well before Ethernet was all the rage. But then Dave started yapping about this MoCA thing. MoCA stands for Multimedia over Coax Alliance and it allows you to transmit Ethernet over coax cable. Since the whole goal here is to transmit Ethernet to where my TiVos are, getting there via the coax cable might actually work for us. In order to take advantage of this MoCA idea, we’d have to spend some money. We’d have to buy an adapter to take Ethernet from our router, and then push the signal out to the coax cable. Location would be problematic, but there might be a way to make that work. We’d have to buy a new TiVo (which it looks like we’d have to do anyway) and we’d have to buy TiVo Minis to replace our existing TiVos. That’s $80 for the Ethernet to coax adapter, $500 for a 6 tuner TiVo Bolt+, and $150 each for the TiVo minis. We’re talking close to $1000. But wait till the end of the tech side of this story before you decide we’re already nuts. Ok, so I’M sold on this idea, but I had to convince Steve. You see, Steve has a serious handicap; he knows too much about electrical routing of signals. He knows what a nightmare of splitters we have inside and outside the house. He was convinced that there’s no way this could possibly work. He went as far as to go up into the attic and draw a picture of the coax setup but remained convinced it would never work for us. I took his hand-drawn diagram and made a pretty version of it in draw.io (LOVE that free diagramming tool!). Sometimes it’s easier to think things out if you’ve got a nice diagram. With the diagram we were able to follow the signal as it would have to travel in our house. Let’s say we put the big TiVo in the family room, and Steve wants to watch TV in his study. The signal would have to go from the Mini in his study to the first attic splitter to the second attic splitter to the outdoor splitter to the family room TiVo and back through that same screwy path. Splitters have one input and several outputs. 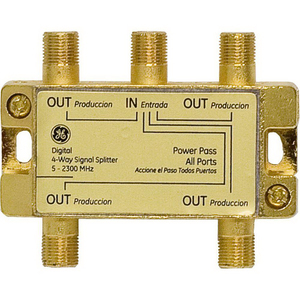 When a signal goes through a splitter, there’s loss. But this screwy path we’re talking about would have a signal going in one output and back out another output, which would add even more loss. It seemed that this shouldn’t work well at all. In addition, you’re talking about Ethernet and the TV signal flying around in and out of these splitters. That’s when we did some reading and learned that the cable TV signal is below 1GHz and the MoCA signal is around 1.5GHz. This would help with the interference but we still didn’t see how it could work. We were paralyzed on what to do. Finally I realized that there was a way to move forward without taking a big risk. I suggested to Steve that he buy the TiVo Bolt+ and just leave everything else in place. He liked this idea a LOT. After he got happy with the idea, I suggested he just pick up one TiVo Mini and the adapter and test it later after he got the Bolt working. Even though he remained doubtful that it would work, at the very least he’d get his broken TiVo replaced. He bought the Bolt+ and one Mini and the adapter from Weaknees, and they took the hard drive back for a full refund. Steve shot off a note to Dave Hamilton including our ridiculous coax wiring diagram asking him whether he thought it could possibly work. Dave said that it looked pretty much as inefficient as his own coax network and his works great. 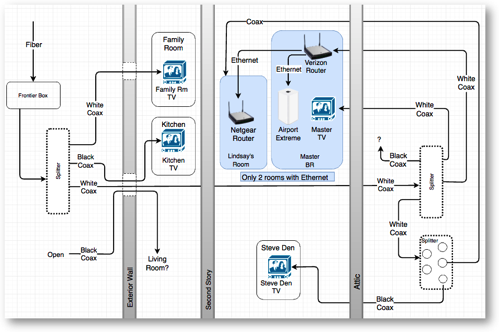 In reviewing our diagram, Dave noted that we have Frontier (formerly known as Verizon FiOS). Turns out, if you have FiOS, you probably already have MoCA running in your coax! That means the $80 adapter we bought was unnecessary, and it means that we don’t have to tap into Ethernet anywhere in the house, because the entire coax network in our house is already MoCA-enabled. Now it was looking easier to at least test this crazy MoCA idea. Steve plugged the TiVo Bolt+ into coax in his study, installed the cable card and had Frontier provision it to the new device, and activated the Bolt with the TiVo service. Sure enough, without telling the Bolt about our WiFi network, it was able to access channel information and record. So MoCA was working in the house! Since I’d talked Steve into picking up that one TiVo Mini, it was an easy push to just plug it into coax in another room. Now remember the Minis would essentially be clients to the Bolt as a server. All recordings would happen at the Bolt, but recordings could be created and retrieved using any of the Minis. We plugged the Mini into coax in another room, but sadly during setup it said it couldn’t find the Bolt. We were sure this was the problem we’d been expecting and we were sad. But I went online and did a ton of searching for people seeing this error screen and found a lot of people chatting about it. I finally found the two-part solution. 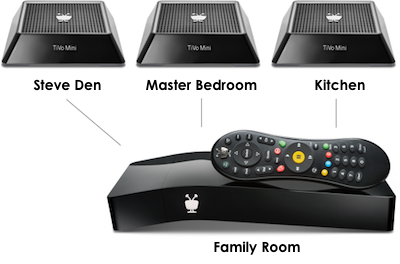 Even though the TiVo Minis don’t have a monthly fee, you do have to activate them with TiVo at zero cost. Interesting. But here’s the really tricky bit. We activated the Bolt first, so the server at TiVo.com knew about it, then we activated the Mini so the TiVo.com server knew about it, but you have to go back to the Bolt and tell it to check the TiVo.com server again to find out about the Mini. Weird, but makes sense I guess. Finally we were able to get the Mini to see the Bolt…and it worked PERFECTLY. All of our fears about sending the Ethernet signal back and forth through all of those splitters were unfounded, it worked great, and it was fast. I guess it’s comedic that we were surprised, like who knew that technology had sped up in the last 6-8 years? We were so delighted that I ran over to Best Buy (only because Weaknees was closed on the weekend) and I bought two more Minis. We plugged them in, activated them at TiVo.com, told the Bolt to talk to TiVo.com again. Boom, we have TiVo in four rooms! I know I’ve taken a long time to tell this tale, as I often do, but let’s review all we actually had to do. Way back at the beginning of this story, I told you to wait to hear why we aren’t crazy to pay nearly $1000 to replace our TiVos. Our cost again was $500 for the Bolt+ and $450 for the three TiVo minis. We didn’t have to pay for the adapter after all so the total cost was $950. But let’s look at what we were paying for in our monthly fees. 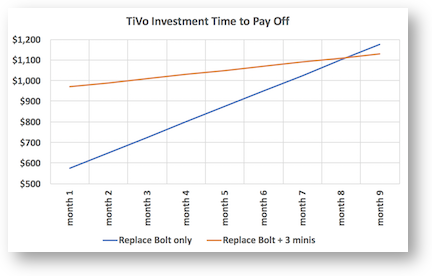 To TiVo we had one for “free” because we had lifetime service, but the other two TiVos were $13 and $20 per month. Not sure why they were different but I suspect I negotiated one of them. So $33/month to TiVo. The cable box was $12/month to Frontier. And then we had to rent 3 cable cards from Frontier for the 3 TiVos. Those were $5 per month each. That’s $27/month to Frontier. So we were paying $60 per month total. But in order to keep having TiVo in those rooms, we’d have to replace the dead one anyway, and it was the one without the service fee. So we have to add $15/month to turn on a new TiVo even if we didn’t do this crazy Mini/MoCA idea. So our monthly cost would be $75/month! Note that this price did NOT include the cost of an actual TV package from Frontier! With the Bolt+ and 3 Minis, we only have to rent one cable card from Frontier for $5/month, and we only have to pay one TiVo monthly service fee of $15/month. That’s a total of $20/month instead of $75 or a savings of $55/month. If we do some complex cipherin’ here, we can take $950/$55 and see that we’ll pay this investment off in 17 months. But remember we were going to replace the big TiVo anyway, so we could look at it as only justifying the cost of the 3 Minis, so it’s $450/$55 and we pay these back in only 8 months. So now we have much faster TiVo service, we have one centralized place where all our recordings live and can be accessed from any room (our old TiVos used wireless G so were too slow to transfer shows), the new TiVos will work with 4K when we’re ready for that, and in a year and half we’ll actually be saving money. The bottom line is that I can highly recommend the TiVo Bolt+ with Minis over MoCA and I can highly recommend you listen to Chris Ashley and Dave Hamilton because sometimes they’re right. And by the way, we still have no idea why MoCA works in our house.